Property 3: 1 bed self contained apartment for 2 people. In a quiet village in North Creuse. 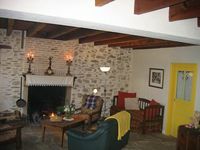 Property 10: The Barn at Vijon - "Serenity for the Soul"
Character filled townhouse in Boussac, Creuse. Property 11: Character filled townhouse in Boussac, Creuse. Beautiful Stone Farmhouse Stunning Views Nestled in rolling Creuse countryside! Property 14: Beautiful Stone Farmhouse Stunning Views Nestled in rolling Creuse countryside! Farmhouse in rural hamlet. Very quiet surroundings with private rear garden. Property 21: Farmhouse in rural hamlet. Very quiet surroundings with private rear garden. Meetings and Gastronomy in a Longère of the 19th century in a private park. Property 26: Meetings and Gastronomy in a Longère of the 19th century in a private park. Property 29: Cottage "The woodcutter"
We arrived on a cold afternoon to a lovely warm house, a fire burning in the grate and a wonderful welcome by Fran&ccedil;oise. We didn't have many provisions with us and we were very grateful for the brioche, milk and juice that were there for us. Thank you for a lovely stay.